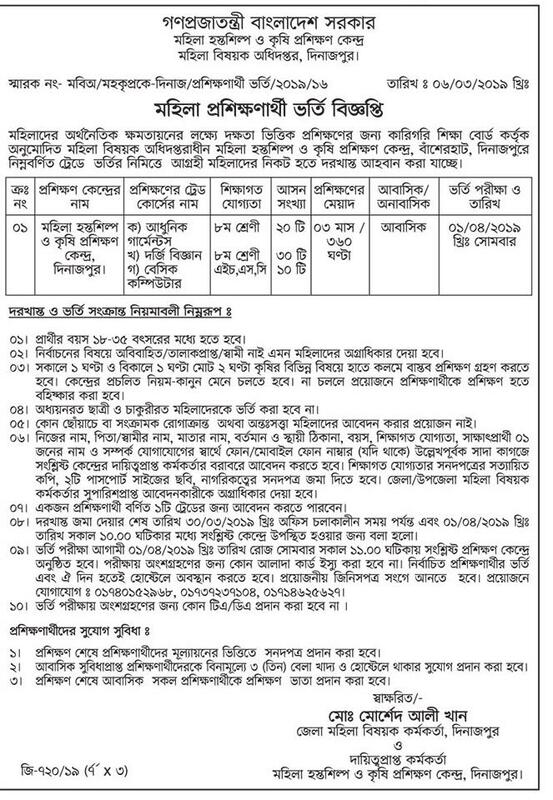 Department Women Affairs Admission Notice 2019 – Get training admission notice for the women. Can be trained on different trade. This training will be provided in a specific time. Women will be admitted to Darji Science, Block Batik, Embroidery and Tides, and Computer Training courses. 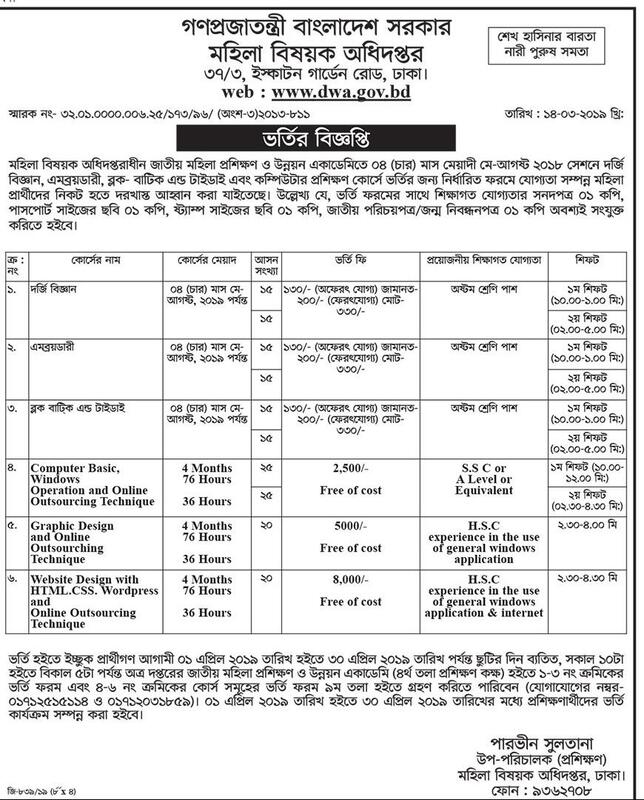 You can collect from Job Circular. Applications are being called from qualified candidates in the prescribed form. Certificate of educational qualification, passport and stamp size photographs, and national ID card should be attached with admission form. The course can be for 4 months. A special payable offsetting must be paid. Applicants willing to be admitted will have to apply within the specified time period. You can collect the application form within the official time. The admission process will be completed between 01 August and 30 August 2019. The women affairs department will conduct the training. 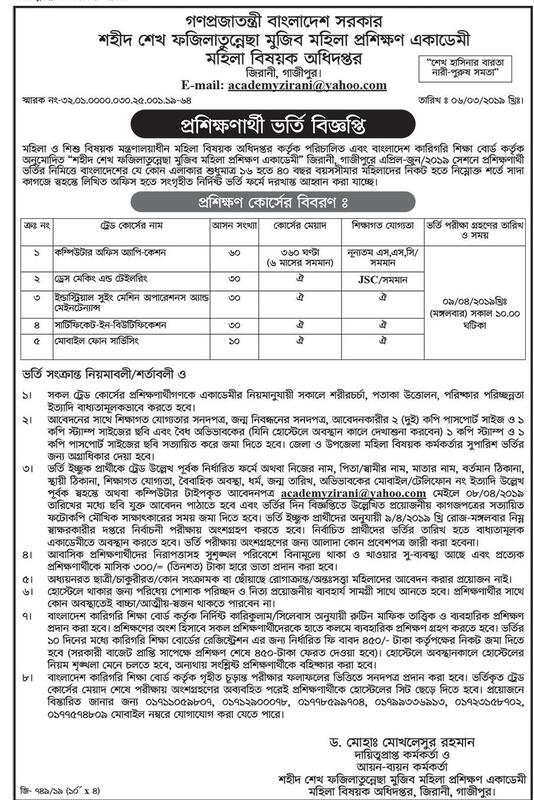 A contact number has been given in the job circular for detailed information. Directorate of Women’s Affairs and Trainees are responsible for conducting training fairly and fairly. So, anyone can take the chance. Here each course is important. Anyone can apply for admission in any topic. You can receive free training at low cost and free. JSC / SSC and HSC pass candidates can apply. Different shifts will be provided for the trainees. Women’s Affairs Department has made important contributions to women empowerment. The women behind the community are moving towards the front. Before the women were far behind. Being self-reliant, women are moving forward. There is no alternative without technical training. There was a time when women were neglected. Only the housework was kept confined. Even not too much education was allowed. Family members retain women. They think that girls should get married faster and do not need to be self-reliant. Women were far behind in various jobs. In this case, society has a responsibility. In fact, women were backward because of this society. Changes in our mentality are important. Men and women are seen in different eyes. It should not be done at all. The official website is www.dwa.gov.bd. Women Affairs Department is working to protect women’s rights. Women are being protected by being self-reliant. Currently, women are getting the chance to work in different organizations. This topic is helping to advance society and the state. Thus, a discriminatory society was established. Directorate of Women Affairs has made a significant contribution to preventing women’s repression. Creating opportunities for self-employment opportunities for neglected women in the village. Finally, I want to tell about the importance of the training course. Nowadays, real education is not achieved only when you get certificates. Get technical education to get the job. Jobs should change their mentality. The mentality will be given employment. That’s why you have to be proficient in any topic. Financial assurance can take women forward. The women’s economy will advance when women enter the workplace. So women should have this course to be self-reliant.